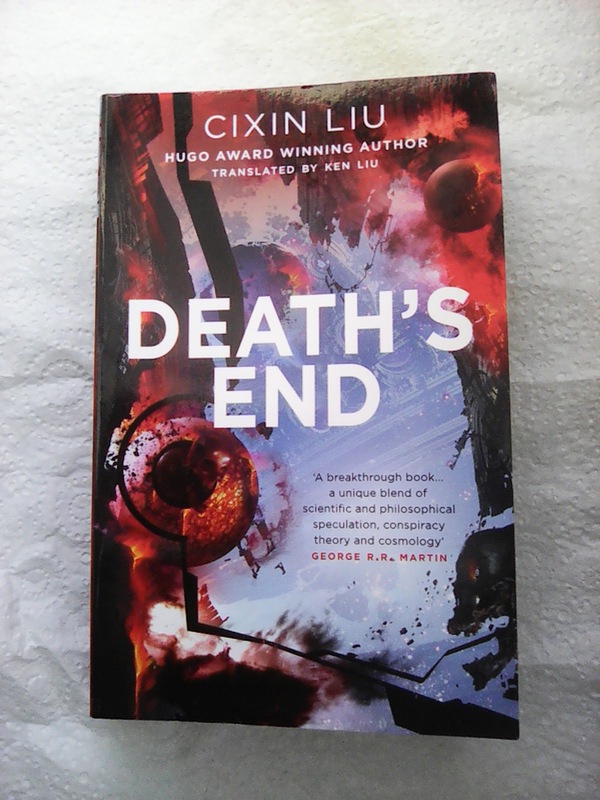 I have been reading CiXin Liu's "Deaths End", the third book in a science fiction trilogy "The Three Body Problem" translated by Ken Liu from Mandarin. It was originally published by Chongqing Publishing Group in Chongqing, China as 死神永生 in 2010 and according to the blurb on the cover and first page, the author has won numerous awards and the translators short story "The Paper Menagerie" has won a Hugo award, among other awards. The major setting of the story is that an alien invasion (the Trisolarians) have been fought off and a detente has been reached, with descriptions of cultural change as the story progresses. I have to say, I initially found the protagonists difficult to visualize but overtime derived a sense of the main characters, some more amusing than others. It is a science fiction setting big in scope and ideas that are more shown than described in theory, he has scenes where people in meetings record alternatives to problems, listing the pro's and con's and it is interesting the type of choices the various groups make. Because this is the third book in the novel, there is a history to the setting and some of the more peripheral characters were major characters in the presceding novels. The technology of the setting, because this is science fiction, describes gravity wave antenna weapons, hibernation chambers, sub light speed drives and has early on an example of a primitive technology that through sacrifice inspired by romantic ideals is able to achieve objectives beyond the technical capabilities of the milieu. For the human characters deep space vessels are few and far between, the product of massive investment and as the novel progresses there is a sense of economies of scale in the different societies shown. The universe of the “The Three Body Problem” trilogy is a hostile place where civilizations that achieve an advanced technological capability without the caution of hiding their galactic footprint are quickly exterminated, “cleansed” by more technologically advanced predatory civilizations. Thus aware advanced civilizations tend to hide themselves, creating many “dark zones”, the political theory of the book describes this setting as a “dark forest” scenario. The differences in the humans and aliens described are tied to major plot points of the novel, the differences are shown instead of described, although that phrase does become problematic in the medium of a novel. It dwells on the necessity of taking a real politic approach to arising situation despite changing values associated with cultural change. There is a kind of literary analysis shown in the book that has interesting ideas. It would be interesting to subject the scenarios and ideas in the novel to a kind of cross cultural comparison, in the same way that 1950’s and 1960’s science fiction and horror movies tend to be seen as reflecting the fears of the public to cold war political events. Perhaps this is an easy and inconsiderate approach to take, but as one of the points the novel makes, we are products of our time. Justin Cronin : The City of Mirrors.